The outgoing president may have made Trump's national Muslim registry tougher to create, but that doesn't mean the US government can stop making foreigners feel unwelcome. An idea the DHS floated (to much criticism) this summer is now part of the official paperwork. 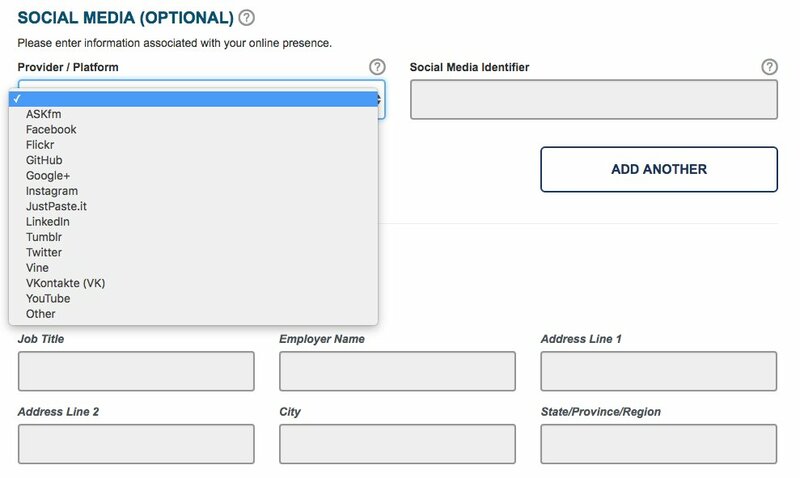 Since Tuesday, foreign travelers arriving in the United States on the visa waiver program have been presented with an “optional” request to “enter information associated with your online presence,” a government official confirmed Thursday.The prompt includes a drop-down menu that lists platforms including Facebook, Google+, Instagram, LinkedIn and YouTube, as well as a space for users to input their account names on those sites. The list is actually much longer than that, covering Tumblr, Vkontakte, Github, Vine, AskFM, and Flickr. And, as can be seen here, the DHS still has this part of the application process designated as "optional." But that may not mean much, not when there's language barriers to contend with. Or applicants who may feel it's a bad idea to leave any blank fields in a government form, no matter what reassurances are given in the page header. Then there's the fact that the DHS went ahead with this data collection despite its being both intrusive and mostly useless. It's supposed to weed out potential threats by examining social media accounts, but this process seems more likely to generate a load of false positives. (Fortunately, the DHS has plenty of experience gathering false positives.) It also failed to provide any information about how this information will be handled and who it will be shared with. "There are very few rules about how that information is being collected, maintained [and] disseminated to other agencies, and there are no guidelines about limiting the government’s use of that information," said Michael W. Macleod-Ball, chief of staff for the American Civil Liberties Union’s Washington office. Macleod-Ball also said it "would be nice" if the government had listened to the civil liberties concerns expressed by groups like his, but, then again, it "would be nice" if the government was generally more proactive on that front -- getting out ahead of complaints rather than just reacting to them. But it's just not going to happen. The government tends to push until something pushes back. And it does a lot of this pushing behind closed doors without asking for public comment. Skipping this "optional" part of the application process may only increase scrutiny. Applicants will still be interviewed by CBP/DHS agents and the questions they field may revolve around any fields left blank. Agencies like these tend to operate with a "nothing to hide, nothing to fear" mindset and may view withheld information -- optional or not -- as the product of a guilty mind. The DHS says it won't officially prevent anyone who doesn't provide this information from entering the country, but there are several unofficial options that will achieve the same result. Then there's the mission creep. Should this become part of the official form, you can expect other government licensing agencies to look at adding the same data gathering to their paperwork. In addition, the example set by the United States will only encourage countries far less interested in civil liberties from gathering this information from visitors to their countries, which means US citizens will need to get used to being more forthcoming with social media identifiers when looking to travel. This is the same country that still has a required Nazi party question on immigration forms when the applicant was born decades after the part folded. It also uses an arbitrary memorization test to help gauge an immigrant's application. This social media question feels like an overextension of that type of thinking. Always have an immigration lawyer in the room with you when you deal with the interviews. I had an agent ask a question they had no right to ask when I did mine. My lawyer was excellent and caught that. They told me not to answer and that the agent was not allowed to ask that. How many immigrants can afford to have a lawyer with them? That'll get you in trouble. Lying to a federal agent is a crime - IIRC, a felony. What would they say if someone claims they don't have one? Would they assume a lie? How does one prove a negative? Dangerous if they catch you in a lie to an official. Much better to just refuse to answer. In my case it wouldn't be a lie. At least, they don't seem to ask for the account password. No real reason to. Once they have your account name, they can just force the company to hand over all the information in your account. Including a great deal of information that isn't readily accessible using the password. Then I could see social media companies packing up and moving out of the United States. If, say, YouTube, packed up and moved to Mexico, because of this, they would no longer be subject to such orders. The USA cannot make a company outside the country hand over users' information, without a court order from that country, and I could see some countries refusing to make Google, Facebook, and others, hand over information to American authorities. "Then I could see social media companies packing up and moving out of the United States." "At least, they don't seem to ask for the account password." No need; social media companies have round heels when it comes to NSL's; they hand over the entire user base. How else can you explain the Yahoo dump? How else can you explain the Yahoo dump? Have individuals in our government become so corrupt that the citizens now need throw away social media accounts? This is pathetic. It is individuals in government that enact this sort of stuff, not the Big Bad Gov as a whole. We cant do anything about the Big Bad Gov. But we can do something about individuals. Maybe it is time to create a registry of those in government who have enacted anti-american legislation so people dont get to forget who it was that took away their freedoms. Just look down at one comment, and one guy has it right. You just create a new fb account and keep that one clean. I like to take car trips all over North America and Central America, and since I travel with 3 phones and two laptops, I always make sure they have been forensically cleaned before crossing the border into eithier the USA or Canada. With all the electronics I carry, it can sometimes generate suspicion from DHS or CBSA, so I make sure my devices have been been scrubbed, in case either agency wants to look at my devices. With malware and stuff like that, you never know what might be on your computer that might get you arrested, so I scrub my laptops, and do factory data reset on my phones before crossing into either the USA or Canada. In Mexico or Central America they do not seem to care, as long as I pay the appropriate import duties for the electronics I come in with. "Maybe it is time to create a registry"
That is a horrible "idea" and I'm pretty sure you already know why. "citizens now need throw away social media accounts?" What about someone who has social media, but never posts anything. YouTube is an example. I have a YouTubue account, but have never posted any videos. It is part of my Gooogle Account I used to read posts on Google Groups. I wonder how the government will handle people who have social media accounts, but have never posted anything to them. Users could make a "decoy" social media account, and give that one to Customs while hiding their real social media accounts from Customs, and Customs would never be the wiser. Screaming about registries and corrupt government and fake/decoy accounts. You guys really have no clue do you? Using decoys amounts to lying, lying to government officials could amount to jail or fines time EVEN if you did nothing else wrong. And this is hardly the first registry that the good ole US government has created. Go ahead you limp SJW's... show your ineptitude and become the next victim of the justice system. Trust me when I say... none of your fellow citizens care about you! Well, you might get a little lip service... that might feel nice! However, if you are bring your devices into the country with you, you just scrub them to defeat any forensics that might be applied. Like I said, I like to take car trips all over North America and Central America. I always run KillDisk and/or Evidence Eliminator on my laptops, and do factory data reset on my phones before crossing into either Canada or the United States, so that anything I don't know about that might get me into trouble cannot be recovered by either CBP or CBSA. How are the going to find out you are using a decoy? The ISP in your home country is certainly not subject any US laws. And second, if you always use a VPN to access social media, that keeps no logs, there are no way they can trace it back to you. And any VPN server that is not in the United States does not have comply with any USA laws. "Using decoys amounts to lying, lying to government officials could amount to jail or fines time EVEN if you did nothing else wrong." Unless you're a politician on the good side of the current administration; any other liar is considered a "terrorist". But how are they going to know if there is nothing on any devices you bring in? That is what programs like KillDisk were made,and what VPNs were made for. Besides, by time time the did find out, someone would probably be back home in their home country, and out of reach of US authorities. What if you legitimately don't have a social media account? Is it going to be like a passport where if you don't have Facebook at all you don't get to come into the country? I myself have no interest in traveling outside the US myself, but I can see where this becomes a slippery slope for other means of identification. I seriously am not interested in the banal activities of 99% of other human beings. Some person I barely knew in high school got divorced, had a kid, has some unqualified opinion about the election -- Who really cares? Why does this raise a "red flag" about me being some kind of homicidal drifter? The fact that I have "nothing to hide" means I don't have anything to show either. I don't use "Social Media", at least to the extent that I actually have any "Social Media" accounts, all I use is email, and [somewhat] anonymous posting on various sites that still allow comments. I don't use Facebook or Twitter or Imagr or LinkedIn or Reddit or Google Plus or any other "Social Media" system. Perhaps I'll have to create some accounts before heading to the US. But that in itself will likely cause suspicion, because those accounts won't have anything in them. It might if they check the date the account was created. Another issue is what happens in California, Oregon, and Washington secede from the Union, and form the Republic Of Pacifica, as they are trying to get ballot measures before voters in those states to do just that. Since Google and Facebook would no longer be in the United States, the remaining USA could not force Google or Facebook to hand over information on any individuals. If the Republic Of Pacifica does come into being, any Internet servers in Pacifica will only be subject to Pacifican law. In other words, the remaining United States will have no jurisdiction over any web site, whose servers are hosted in Pacifica, should this secession movement succeed and the Pacifican nation come into existence. I can imagine the United States, a country that has invaded other countries on very slim pretexts, would find a reason to invade Pacifica to bring it back into the Union. I'm pretty sure the pretext would include words like Fighting Terrorism, and Stopping Drug Cartels and ensuring Global Security. That is why the Yes California group is already opening their own embassy in Russia, and it appears that if Pacifica comes into being, they will have Russian support. If Pacifica does vote to secede, I don't think the US would riak a war with Russia to invade Pacifica. Russia still has enough nukes to blow up the USA several times over. Neither Trump nor Obama would be insane enough to do something to risk Russia nuking the United States. Trump may be a lot of things, but he is not crazy enough to do something to start a nuclear war with Russia. Why would Putin start a nuclear war over California, Oregon and Washington? He may be a lot of things but he's not suicidal. Assuming the Pacifica story is true, I can see the stress generated by the attempt to maintain their levels of cognitive dissonance causing Trump and his supporters' heads to explode as they contemplate holding Russia to account for effecting the breakup of the Union. I mean, Trump is a Putin fanboy now. Would that change if Pacifica called on Russia for support and Putin agreed to help?